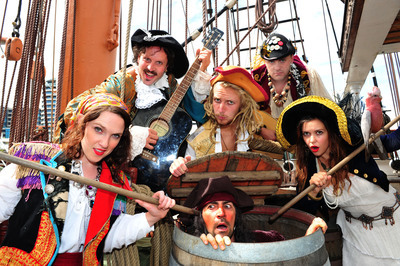 Pirates both young and old are invited to enjoy the new season of Caribbean Pirates at the Polly Woodside this January. Featuring live music, rope swinging, barrel hiding, plank walking and all the rambunctious behaviour of pirates, all the action takes place on and around the historic 1885 tall Polly Woodside ship at Melbourne's South Wharf from January 5-24, 2015. Caribbean Pirates at the Polly Woodside - Doru Surcel (centre) with cast.Image credit Shakespeare Australia. This interactive quest sees small audience members transform into pirate explorers, treasure hunters and all-round rowdy scallywags. The brain-child of 2014 Melbourne Award Winner Glenn Elston with live music written and composed by the mischievous Arky Elston, Caribbean Pirates at the Polly Woodside is rambunctious theatre at it's best. All aboard to meet the fearless hero Major Key, the upstart Larry (who should be Sally) and search for the mysterious and magical Gypsy Pirate! Keep one eye peeled for the menacing Captain Cutthroat, and watch out for Empty Drawer and Scurvy Dave as they scramble for pirate booty! Doru Surcel, who also plays Captain Cutthroat himself, comes on board (walks the plank) as Director of this teeming team of triple-threat buccaneers. As an accomplished theatre educator, Doru plans to draw on the directorial skills of Captain Cutthroat. Whose crew will you join? Choose carefully or you might walk the plank! Will you find the treasure map? Will the magical Gypsy Pirate reap her revenge on Captain Cutthroat and have him keel hauled? Will Larry save Major Key? Children will learn the pirate talk, do the pirate walk, sing the pirate songs - and go on a treasure hunt on the ship to find the lost treasure. For one hour, audiences will be transported to the seven seas with an interactive theatre adventure with swordfights and songs and hearty pirate action aplenty. Showtimes are at 10:00 am and 6:00 pm for most dates. We went to see this last year, and really enjoyed it!